Where do I start?! It was another awesome show this year, somehow it always ends up feeling fresh. There were some REALLY nice new cars and it was also great to see old builds continue to evolve. John and Jeff (and all volunteers) did a commendable job, and their hard work meant everything appeared to go without any major hitches. Seeing Matt and Shant (Bimmerheads) along with Rey (Reyn SpeedShop) and Forrest (Koogleworks) out there was refreshing! Although seeing the steadfast Ireland, La Jolla, Odometer Gears, Chris Castro and the other long-time vendors was also nice. For the show-goers, Awesome to see all the guys from San Francisco and San Diego make the trek. There was certainly an influx of significant others and children this year (which was very encouraging to see). I stayed in the booth for nearly the full duration of the show (thank you to all those who stopped by), but had Eric go around with a camera. Eric is eighteen and has never previously done any automotive photography. He is a fellow student, a hard worker, and an enthusiastic car guy. All the following pictures were taken by him. Big thank you to Eddie, who was kind enough to let us use his car. Ever since Ken Blasko brought out his engine stand a couple years ago, there have been a couple more crop up with each passing year. This year this stand cropped up, along with another from Bimmerheads (which is shown further down). I’ve missed Ben’s Taiga Truck. Happy to see it this time, it’s been a couple years! Wouldn’t be a SoCalVintage show without Norm there. Cheeky guys brought in an E36! Finally got to meet Bill Arnold, that was a treat! Dave Varco’s S14 02, as pretty as always. Tony’s M20 Turbo 02. This car has come such a long way! …. And that’s all for this year! Already looking forward to the next one. Thanks guys. That's a lot of pictures... Well done Eric. Thanks Andrew. Here's a cool pic of the line up, I call it "the Easter basket"
Next one is Dave Schwartz' cab and my 74, called "Fiscal Polarization"
Finally we have "California Cabs"
Thank you for sharing the pictures, it was great to see everyone at the show! Great to see the cars and the few people I got to see. I showed up late lol. Congrats to Andrew on his booth and having some GREAT products for us vintage BMW folks! I hate to be the Ney-Sayer and rain on the parade. But, this parade had less vintage BMWs and more of the 80s and early 90s cars, tuned in the typical "Pimp My Ride" style. Some of these pictures illustrate my point. SocCal Vintage should think about changing its name. Can you seriously call most of this stuff "Vintage" ? Haha, well based on your previous comments, can't say I'm surprised. Sorry it wasn't quite what you wanted. So if you're in your 20's or 30's, is an E30 not vintage? I bet you're a lot of fun to have a beer with, Slavs. Great pics Eric and Andrew! Thanks for sharing! You find e30 BMWs all over Los Angeles; on just about every street and neighborhood, many dumped to the ground and with all types of personalized modifications. Its a very common car on the street. The car was built using the manufacturing process of the late 80s and early 90s; plenty of plastic, etc. This may be your idea of "Vintage", but not mine. It all depends on your definition of "Vintage". "Vintage" for me stopped with the early 70s, when the last of the 60 era styling and designs died. Look what they did with the beautifully crafted Alfa Giulia GT. By 1970, it had a redesigned plastic dash, front grille and US spec bumpers. The 1600-2002 suffered the same faith. The 02 is a transitional car in that it was "Vintage" at its debut, but certainly no longer by 1974. 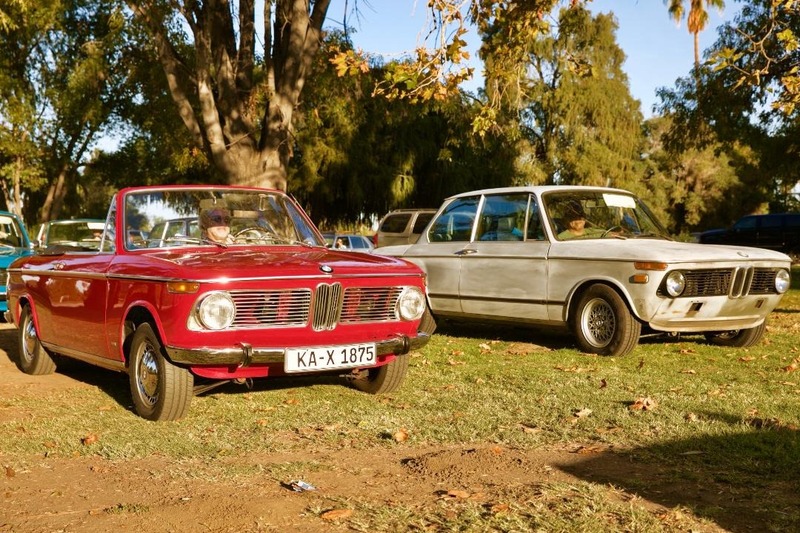 There is nothing wrong about taking your car to a gathering of e21s or e30s at the park and sharing your enthusiasm for your "Pimped Out" rides, but "Vintage" it is not. I enjoy the somewhat period correct resto-mods, though, such as that beautifully prepared New Class 1800Ti with the Alpina A4 motor. And, you guys can drink your "Grog" together, count me out.